About the fate of Lalli, an old poem that I read many years ago has him sking in hellfire after death. But how do the skis not melt tho? Melt? What was I thinking? O shame, where is thy blush? Dude, it's not literally true. There are no skis in hell. 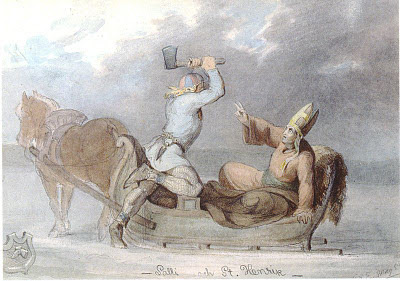 Hey, Boniface, I'm Finnish on my Mother's side of the family, and if the Kanteletar says Lalli is sking in hell, that's good enough for me! ROTFL! FAITH Magazine's definitions of "Inspiration"